I have a little problem. It’s called Pinterest. I have another problem. I’m a big old nerd. I can actually hide it pretty well but once I get rolling about Harry Potter, Angry Birds, Twilight or anything else remotely nerd-tastic, I cannot be stopped. 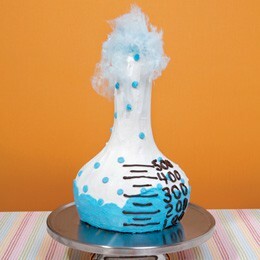 So today I have decided to embrace my inner-nerd and post a bunch of FUN Nerd-inspired cakes that I found via Pinterest. Why, you ask? Because today, August 15th, 2011, is the last day of my twenties. Tomorrow I will wake up and be 30 and I will have to talk about important things, like Roth IRAs and income taxes, because that’s what thirty year-olds do, right? No longer will it be acceptable to have an all night text-fest with my best friend discussing who could win in a fight…Hermione Grainger or Bella Swan. (My money is on Hermione, by the way). If you don’t like today’s post, I truly am sorry. However, take that for what it’s worth because once I turn thirty I’ve decided it’s time to stop apologizing for things. First up..the true essence of my Nerd-dom…Harry Potter. Harry was found via Pinterest. I love this cake and could see a true Harry Potter fan serving it up at their wedding — like my sister-in-law, who loves Harry so much, I believe she’d marry him if he was real. This one is a three tiered stacked round cake, covered in colored fondant. Black, gold and burgundy…looks like a true Gryffindor fan to me! 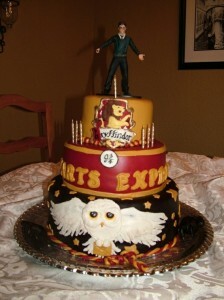 Hedwig (the owl) covers the bottom tier, while the center tier is a homage to King’s Cross Platform 9 3/4. The topper is none other than Harry himself. I’m a Twi-hard. I’ll admit it. I’m totally Team Jacob though–even though I think Edward is a totally piece of man meat. I don’t think my husband would ever, ever go for a Twilight cake…unless…he didn’t KNOW it was a Twilight cake. 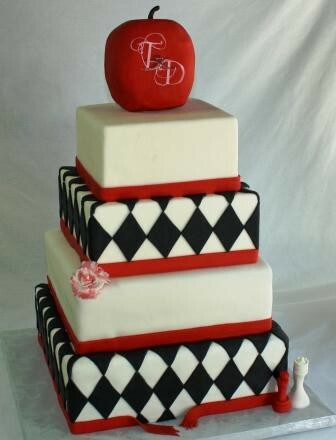 To me this looks like a classic square cake covered in fondant and decorated with black and red designs. You’d have to be a true fan to notice the chess pieces, the broken ribbon at the bottom of the cake, and the apple cake topper. This could work for either a Twilight- themed wedding or even an Alice in Wonderland theme. I can see both of them working here. That is until Edward pops out of the cake and gets all thirsty from our scents and tries to kill us. Oh but wait! There’s Jacob on his motorcycle coming to save us. Phew. Let’s totally switch gears and take a trip to Florida for our next stop. Orlando, Florida that is…and more specifically…Walt Disney World. As a married couple, Dave and I have been to Disney World seven times. How many times have we taken our son? Zero. Not because we are bad parents–we just haven’t gone since he was born. If you do that math that means we went to Disney World seven times in five years. Yup, Dave still married me. Disney Weddings are nothing short of an amazing experience. I haven’t had the pleasure of attending one but I certainly stalk the Wedding Blog community for pictures of Disney weddings and they always impress. I seriously considered a Disney wedding until I figured out how many important people would not be able to attend…so then we gave up that dream and did a Disney honeymoon instead. Another option could have been a Disney-themed cake. 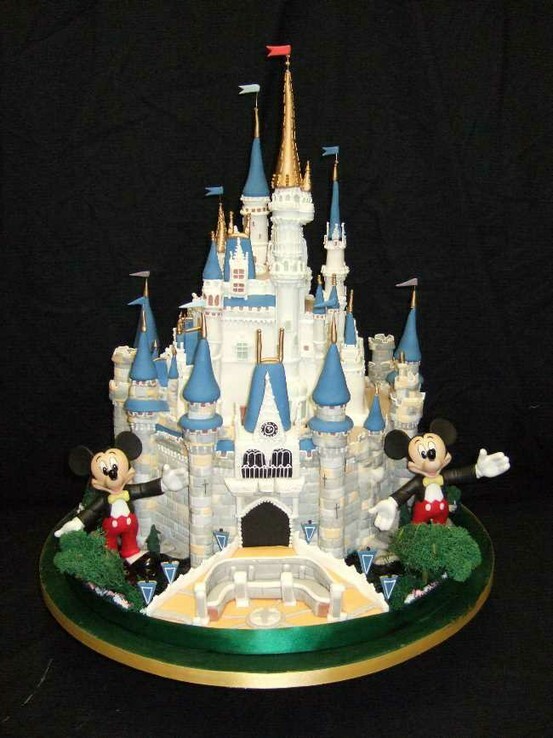 I have featured a handful of Disney cakes on here, like this one, this one, and this one…ranging from the subtle to the extreme. I consider this one extreme because you know EXACTLY what this cake is all about. It features Cinderella Castle and the main mouse, Mickey. This cake is amazing to me because every single detail is spot on. I cannot imagine how laborious this cake must have been to make. The Cake Boss made a similar cake on his show. No offense to the Boss but the cake featured above shows so much more precise detail. It’s gorgeous–I don’t think I could eat it. So there you have it. All the facets of cake-nerdom that can make a wedding cake unique and special. I mean..if you and your hubbs-to-be have a similar passion and perhaps it impacts your relationship in a big way–why not make a cake out of it? 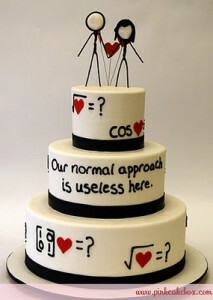 So get your nerd on and eat cake. What is your favorite nerd cake? If this was your post what cakes would you feature? Are you a closet nerd like me?